The specification of safety lighting can be one of your most crucial decisions. People's lives depend on it. Certainly the aesthetics of each exit area depends on your choice of sign. 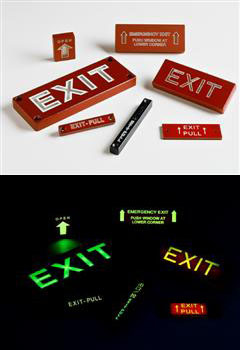 With it's self-luminous tritium power, easy installation and sleek design, the Luminexit (B100) self-luminous exit sign is revolutionizing the emergency exit industry. Today, businesses have to do more with less resources, so SRBT has created an emergency exit sign with up to twenty years of maintenance-free life. This self-luminous sign will maintain its illumination day in, day out, for up to twenty years depending on the initial illumination selected. This maintenance-free operation is why many building owners specify Luminexit: it saves them money while providing reliable, safe passage. Luminexit is vandal resistant, waterproof, explosion proof and incapable of generating sparks. Wherever architectural integrity is a priority such as schools, hotels, office buildings, banks, theaters and restaurants, or harsh and dangerous environments such as offshore oil rigs, mines, refineries, munitions plants, and chemical factories, Luminexit is the sign of choice. SRBT built its foundation on quality, service, and customer satisfaction. In continuing with this tradition, SRBT is the only company in the world that recycles/reclaims the tritium gas in old signs. 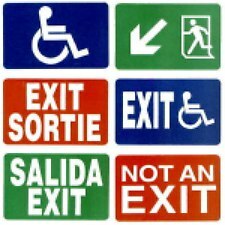 When an exit sign reaches its expiration date, SRBT will recycle the exit sign as part of our service to the customer. When you specify Luminexit, you can be confident that you have installed the very best in safety, providing building occupants with reliable safe passage. 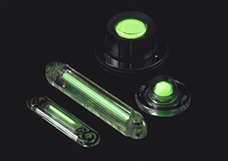 Betalight tubes are manufactured from borosilicate (hard) glass internally coated with zinc sulfide phosphor and filled with tritium gas. No electrical energy source required. Cased in high impact ABS fire-retardant plastic. Legend covers: red, green, or black. Frame colors: Aluminum, white or black. Up to 20 years based on initial brightness option selected. Betalux-E is specifically constructed to resist tampering and vandalism. And, whenever you have to specify exit signs for an explosive, corrosive, humid or other harsh environment, Betalux-E is the sign of choice. Minimum initial brightness at time of manufacture of 0.15 foot lambert. Cased in high impact ABS fire-retardant plastic, with matte clear lexan cover. Face covers: red, green, or black. Case colors: Grey, white or black. These self powered illuminated signs are designed for use in the latest aircraft. Safe and reliable, they are characterized by the complete absence of any power supply, batteries or electrical connections. The lettering, on a white or red background, has excellent legibility under all conditions of light or darkness, while the neat and slim design ensures that the signs will blend with any furnishing scheme. Being entirely self-powered, these signs can be fitted in any position without reference to the air craft power supply. No maintenance is required during their useful life of many years. The signs have a working life of many years. However, it is recommended that signs are checked every 5 years and, if the brightness level has fallen below a level acceptable to the operator, the signs require replacement. These signs meet both Federal Aviation civil requirements in the U.S.A. (F.A.R. 121-310 5th June 1965) and international Military Aircraft requirements (British Av. Pub. 970 Ch.107). They have been granted the U.S. Atomic Energy Commission General License (GL-231). U.S. customers will appreciate that this means that no specific by-product material license is required. In emergency situations, Betalux safety signs assist personnel to identify emergency exits, fire equipment and assembly points, even when the main power supply has failed. Betalux is entirely self-powered. It does not rely on any outside energy source for its illumination. It requires no electricity, no back-up batteries or generators to keep working in a crisis. It can be mounted anywhere without wiring or outlets, and needs no maintenance. The signs have a working life in excess of 10 years providing significant energy cost savings. Betalux is specifically constructed to resist tampering and vandalism. And, whenever you have to specify safety signs for an explosive, corrosive, humid or other harsh environment, Betalux is the sign of choice. It is incapable of sparking so there is no problem with accidental ignitions. It is totally sealed, explosions proof and has no wiring, internal or external, so there is no trouble with corrosion, mold, or vapor invasion. This internal illumination enables the sign legends to be visible at distances in excess of 40 meters in all lighting levels including total darkness. Betalux safety signs are ideal for new buildings or refurbishment projects and do not require structural alterations or disturbance of decor. When you specify Betalux self-luminous safety signs, you can be sure that you have done everything possible to assure safe, continuous, well illuminated emergency lighting for all building occupants now and well into the future. Do not hesitate to contact us for ordering information, or for a product demonstration by a representative in your area. levels, from 80μl to 900μl (microlamberts). 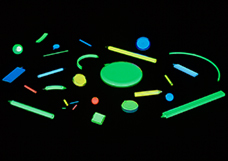 Markers can be supplied with green, orange, red, yellow or blue lights. Standard enclosures are made of tough, impact resistant, durable polycarbonate and acrylic plastics for use in any environment. Remote or unserviced installations: absolute reliability, long-term illumination and marking. Details and Illustrations represent the Betalight basic range only. Betalights can be manufactured to suit individual requirements in any colour in the spectrum and to virtually any size or shape. Contact us with your lighting problems. Betalux is entirely self-powered. It does not rely on any outside energy source for its illumination. It requires no electricity, no back-up batteriesor generators to keep working in a crisis. It can be mounted anywhere without wiring or outlets, and needs no maintenance. The signs have a working life in excess of 10 years providing significant energy cost savings. Betalux is specifically constructed to resist tampering and vandalism. And, whenever you have to specify safety signs for an explosive, corrosive, humid or other harsh environment,Betalux is the sign of choice. It is incapable of sparking so there is no problem with accidental ignitions. It is totally sealed, explosions proof and has no wiring, internal or external, so there is no trouble with corrosion, mold, or vapor invasion. 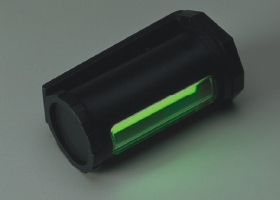 Tactical devices are illuminated by Betalux® Self-Powered light sources that require no batteries or maintenance, but which will operate with absolute reliability over many years. These devices will continue to function in all environmental conditions. They are extremely lightweight, compact and rugged and will never affect night vision. Illumination is also available in a variety of colours to suit various applications and requirements. A multi-purpose personal illuminator that, by rotating the outer sleeve, enables four clearly defined illuminated profiles. Suitable for use as a torch, personal marker (belt clip included) and route marker. Uses green light. Protected by a black neoprene rubber housing with hinged front cover, the Betalight® Torch is a general purpose illuminator, particularly suitable for reading in darkness. Uses green light. 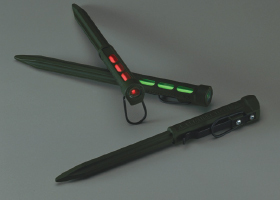 The self-illuminating Peglight is a tough, impact resistant spike with a Betalight® securely fitted within. With a viewing angle of 90º the Peglight enables guy ropes or paths to be clearly but discreetly marked. Available in a range of Betalight® colours. 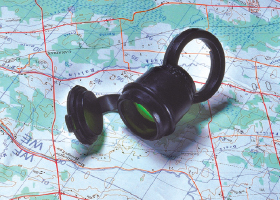 Enables illumination and magnification of maps in twilight and in darkness in any environmental conditions. 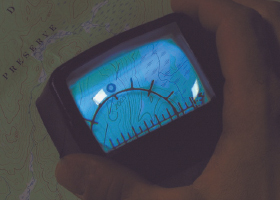 White Betalights® ensure that map colours are accurately reproduced and a solid lens eliminates ingress of moisture and ensuing condensation. Housed in impact-resistant black rubber.